MANSFIELD, Mass. – The Hornets had plenty of motivation heading into Saturday afternoon’s matinee with Bishop Feehan in the Albertini Gym. Mansfield lost in three sets to the Shamrocks in he regular season and also were trying to erase the disappointment of last year’s first round home loss to league rival Taunton in the opening round of the playoffs. With all of that “fuel for the fire,” as Mansfield coach Melissa Heeden called it, there was no surprise that the Hornets came out firing in front of their home crowd. Mansfield kept the pressure up from the opening point and rolled to a 3-0 (25-11, 25-13, 25-21) victory, which advances the Hornets to the Div. 1 South semifinal. “We tried to make some adjustments on some of the little things,” said Heeden on the difference between the first meeting with Feehan and Saturday’s performance. Mansfield trailed 5-4 in the opening set when senior setter Chloe Peters stepped to the service line and she sparked an 8-0 run to take control. Peters, who finished with 32 assists and 11 service points, had an ace and three kills in the first and along with libero Jess Haradonand senior Jacey Anderson controlled the match with pinpoint serves. Once in the lead, the Hornets stepped on the gas to put the first set away. Junior outside hitter Julia Harrison (eight kills and seven service points) had a pair of kills, as did senior hitter Emily Kleber who closed out the set with kills on two of the final three points. In the second, Mansfield again found itself trailing 5-4 but again it was the service game that turned the momentum. A 14-5 run put the Hornets in front with a sizable cushion. Middle hitters Olivia Broyles and Meg Hill both stepped up to control the net against Feehan’s Kathryn Sachs. Each had three kills in the second. Heeden was asked about the confidence the Hornets showed in the opening two sets to dominate the match and she credited the difficult league campaign with building the belief that the Hornets can beat anyone. Heading into the third, the Shamrocks were determined not to go quietly and started to push back despite falling behind early. A kill by Broyles and a block by Emily Ascoli pushed the Hornets lead to 16-11 but Feehan scored the next four points before Heeden called a timeout to emphasize how important it would be to close out the match in the third. Feehan stayed within a point until a serve into the net gave Mansfield a 21-19 edge. Haradon (19 digs and seven service points) followed that with an ace and, after an error, Hill (team-high nine kills) stepped up with back-to-back kills that made it 24-20. The Shamrocks got a point off a service error and then Hill wrapped up the win with another angled blast to the sideline. Now Mansfield (15-5) awaits the winner of top seed Barnstable and Oliver Ames, which play on Tuesday. A Tigers upset would give the Hornets another home game, but Heeden thinks the Hornets would be ready for the hike to face the Raiders. Mansfield, 1 @ Attleboro, 1 – Final – Mansfield’s Sam Hyland scored the tying goal with 10 minutes left in the game. Hyland scored on an assist from James Chotkowski, who got a touch off of Max Gurnon’s throw in. Canton, 1 @ Milford, 1 – Final – Freshman Jordan Borges scored his second career goal to put Milford ahead early in the second half but Canton leveled the match with a penalty kick with six minutes to go. Milford head coach Brian Edwards said Zachary Browne and Marcello Panna both put in great performances. Stoughton, 0 @ Foxboro, 2 – Final – Foxboro’s Hussein Kafel scored the game winning goal midway through the first half for the Warriors while Anthony Barreira iced the game with a goal in the final minutes. North Attleboro, 0 @ Sharon, 0 – Final – Shawn Watters notched his second straight shutout and fourth overall in net for the Rocketeers. Taunton, 1 @ Franklin, 1 – Final – Farley Asmath opened the scoring in the 39th minute off a feed from freshman Sam Stowell to put Franklin up 1-0 but Taunton’s Daeshawn Duffie answered a minute later to level the match just before half. Attleboro, 0 @ Mansfield, 4 – Final – Stephanie Kemp and Amanda Mangano each recorded two points as Mansfield stayed unbeaten on the season. Kemp scored once and had an assist while Mangano had two helpers. Bryn Anderson, Emma Goulet and Emily Vigeant each scored once for Mansfield. Sharon, 0 @ North Attleboro, 6 – Final – North Attleboro’s Haley Guertin tied a school record with five goals in the Rocketeers’ big win. Emma Gaulin scored the other goal for Big Red. Rachel LaBonte had two assists while Emily Chiasson, Sam Hawkins, Ashlyn Gaulin and Britta MacDonald each had one assist. Head coach Bill Wallace said Grace McGoldrick and Julianna DiRenzo played exception in midfield. Oliver Ames, 1 @ King Philip, 0 – Final – Oliver Ames junior Abby Reardon netted the game winner in the first half to lift the Tigers. OA head coach Britt Sellmayer said Regan Benton had a strong game in goal to earn the shutout and said both Lauren Wright and Dana Lowney played well for the Tigers. Mansfield, 3 @ Attleboro, 0 – Final – Mansfield picked up a 25-9, 25-15, 25-18 sweep on the road. Jess Haradon had 10 service points and 15 digs, Jacey Anderson had 10 digs and Anna Kemp added 14 service points for the Hornets. Stoughton, 3 @ Foxboro, 2 – Final – Juniors Jordan Motley and Val Whalen combined for over 30 kills for Stoughton while senior Riley Bagley and sophomore Mia Bennett kept the defense strong with over 80 digs. 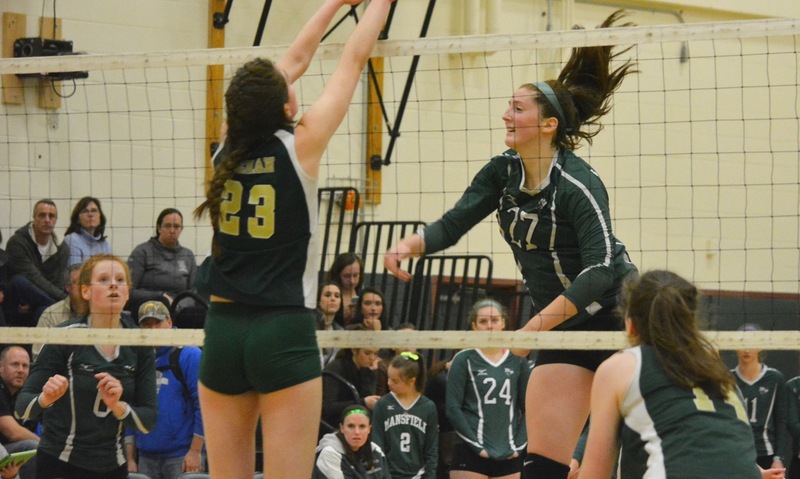 King Philip, 3 @ Oliver Ames, 1 – Final – King Philip picked up the 25-17, 23-25, 25-15, 25-18 win on the road. Angela Vellante had 19 service points, three aces and four digs for King Philip while Sydney Phillips added 17 kills and 19 service points and Liv Balduf chipped in with 11 service points and three kills. KP head coach Kristen Geuss said Molly Croke had an excellent defensive game. Oliver Ames’ Bridget McCarthy had 20 assists and three aces. Taunton, 0 @ Franklin, 3 – Final – Erin Skidmore led the Panthers with 10 kills, eight digs and two aces while Maddie Kuzio added 19 digs, two aces and a kill and Meaghan Maguire finished with four kills and three blocks. Taunton, 0 @ Franklin, 5 – Final – Franklin senior Nicole Denommee scored her first varsity goal on the while Annie Walsh, Alex Sullivan, Cassi Ronan and Caroline Lounsbury each scored once. Senior Samantha Hertzberg got the shutout in goal making three saves. Foxboro, 173 @ Attleboro, 169 – Final – Ethan Johnson led Attleboro, earning co-medalist honors with a round of 40. Brian Houle shot a 42, Corey McKenna shot a 43 and Taron Mills carded a 45 to pace the Bombardiers. Foxboro’s Colby Nickerson shared medalist honors, shooting a 40 as well. Taunton, 166 @ Franklin, 164 – Final – Matt D’Errico led Franklin with a 38 while Bryan Woelfel carded a 39 for the Panthers. Taunton’s Mike Volkmann and Justin Proto shared match medalist honors, shooting 36 on the day. Attleboro, 1 @ North Attleboro, 0 – Final – Harry Lancaster scored the lone goal of the match, heading home a set piece service from Zach White for Attleboro. Franklin, 1 @ Canton, 1 – Final – Franklin’s Farley Asmath opened the scoring off an assist from Nitin Chaudhury to give the visitors a lead but Canton’s Ben Waterhouse tapped in Jake Verille’s free kick with 14 minutes to play in the first half to bring the Bulldogs level. Taunton, 0 @ Foxboro, 4 – Final – Senior Anthony Barreira netted a brace and Shane VandenBoom and AJ Bubencik each scored once as Foxboro earned its first shutout win of the season and second consecutive shutout. King Philip, 2 @ Stoughton, 0 – Final – The Warriors of King Philip netted a pair of first half goals and scored their ninth shutout of the season in the win. Senior Cam Mullins won possession at midfield and played a through ball to junior Tyler Mann, who finished at the far post in the 17th minute. KP doubled its lead when Jack Bush sent Nils van den Boogaard in and he finished at the far post in the 30th minute. Canton, 0 @ Franklin, 2 – Final – Halle Atkinson and Miranda Smith netted second half goals to lift the Panthers. Nadia Havens and Atkinson registered assists for Franklin. Foxboro, 4 @ Taunton, 2 – Final – Mackenzie Fraser scored two goals and recorded an assist for the Warriors. Milford, 1 @ Oliver Ames, 2 – Final – Kiana Lozzi scored the opener in the first half for the Tigers. After Milford tied the game in the second half on a goal from Maggie Boyle, Abby Reardon scored the game-winner for OA in the final minute. Stoughton, 0 @ King Philip, 8 – Final – King Philip’s Avery Snead and Logan Greenberg each scored twice, Abby Baker and Chloe Layne each registered one goal and one assist, Maddie Smith and Rachel Hogan both netted a goal apiece and Emma Corcoran recorded three assists in the win. Franklin, 1 @ Canton, 3 – Final – Canton won the first two sets, lost the third but sealed the victory with a big win in the fourth set, 25-19, 25-15, 26-28, 25-12. Canton middles Casey Shea and Emma Murphy both had strong nights to lead the Bulldogs, putting down eights kills with just one error apiece, and combined for five blocks. Head coach Pat Cawley said Nicole Poole did a great job distributing the ball, finishing with 26 assists, 11 digs and three kills. Canton’s defense of Julia Panico, Maria Mackie, Erika Lum and Emily Lynch was strong throughout the night. Franklin’s Erin Skidmore had 13 kills, three aces and 10 digs, Maddie Kuzio finished with 34 digs, Lauren McGrath had 31 assists and Meaghan Maguire had six kills and a block for the Panthers. Taunton, 3 @ Foxboro, 2 – Final – In a seesaw affair, Taunton won the first, third and fifth set to earn the win, 26-24, 20-25, 25-21, 17-25, 15-9. Taunton head coach Toby Chaperon said Emily Moor had a fantastic all-around game with 16 kills, 15 digs and six aces. Abby Waldron nine digs, eight kills and four aces and Kayli Fagan set up the offense with 31 assists. Mansfield, 3 vs. Brockton, 0 – Final – Mansfield landed a sweep against the Boxers, 25-19, 25-15, 25-14. Jess Haradon had 18 digs and 15 service points for the Hornets while Jacey Anderson had 10 service points and Meg Hill added eight kills. Oliver Ames, 3 @ Milford, 2 – Final – Oliver Ames won the first, third and then edged Milford in the fifth set to earn the win on the road, 25-21, 18-25, 25-22, 20-25, 16-14. “This game was hands-down the best game we’ve played all season and a great way to fight for the win and earn every point,” OA head coach Chelsea Correira said. Sadie Homer led OA with 16 digs, “dominating in the back row,” according to Correira. Bridget McCarthy had 31 assists and two aces, Kayla Raymond added11 kills, three blocks, two aces and Maya Fetcho had six kills and a block. King Philip, 3 @ Stoughton, 1 – Final – King Philip picked up the road, 25-21, 23-25, 25-23, 25-16. Carly Adams led KP with 25 service points and 23 assists, Sydney Phillips added 13 kills and 17 service points, Amanda Loewen had 12 digs and 14 service points and Angela Vellante chipped in with 20 service points and four digs. Stoughton’s Val Whalen had a game-high 15 kills while Christina Gelin and Riley Bagley combined for over 60 digs for the Black Knights. Canton, 28 @ Foxboro, 27 – Final – Brendan Foley (18:44) led four Warriors in the top six, along with Aaron Kaplan, Matt Kelly and Trey Lawson. Canton, 34 @ Foxboro, 21 – Final – Abby Hassman and Lindsey Nelson finished 1-2 in 20:42 to lead the Warriors to the win. Sophia Mellen (4th), Maddie Treweek (6th), and Edina Busznyak (8th) were the scorers for Foxboro. 2nd Quarter: (M) Diogo DeSousa 20 yard field goal; (KP) Brendan Lydon 25 yard pass to Sean Garrity, Matt Franz XP good. 3rd Quarter: (M) Nick Graham 50 yard rush, D. DeSousa XP good; (KP) Alex Olsen 2 yard rush, M. Franz XP good; (M) Anthony DeGirolamo 66 yard pass to Hunter Ferreira, D. DeSousa XP good. 4th Quarter: (KP) B. Lydon 1 yard rush, XP failed. 1st Quarter: (A) Cam Furtado 2-yard rush, Paul Deluca XP Good. 2nd Quarter: (T) Noah Leonard 17-yard pass to Adam Mclaughlin, John Teixeira XP Good; (A) Marc Dieu 10-yard rush, P. Deluca XP good; (A) C. Furtado 24-yard rush, P. Deluca XP good; (T) N. Leonard 70-yard pass to A. Mclaughlin, J. Teixeira XP good. 3rd Quarter: (A) Tyler McGovern 11-yard rush, P. Deluca XP good. 4th Quarter: (A) Taunton fumble, Safety; (T) T.J. Mendes 2-yard rush, 2-point conversion failed; (A) T. McGovern 1-yard pass to Shane Hamerski, P. Deluca XP good. 1st Quarter: (C) Dennis Ross 55 yard rush, Thomas Monagle XP good. 2nd Quarter: (C) D. Ross 48 yard rush, T. Monagle XP good; (F) Mark Clagg 15 yard pass to Jamaine Few, XP good. (F) Trey Guerrini 60 yard punt return, XP good. Overtime: (F) M. Clagg pass to T. Guerrini, XP good. 2nd Quarter: (F) Jake Wolowacki 1 yard rush, Matt Zucco XP good; (OA) Anthony Berksza 27 yard rush, XP no good. 4th Quarter: (F) J. Wolowacki 2 yard rush, XP blocked; (OA) Liston Funai 5 yard rush, Kyle Gagliardi 2pt pass to Brandon Timulty. Attleboro, 3 @ Taunton, 0 – Final – Attleboro freshman Mike Russo opened the scoring early in the first half for the visiting Bombardiers while Nick Lawrence potted a pair of goals in a short span in the second half. King Philip, 4 @ Franklin, 0 – Final – King Philip cashed in the first five minutes as junior Tyler Mann put the Warriors up in the fifth minute on an assist from Zac White. Colby Koch doubled KP’s lead in the 20th minute, on an assist from Jack Bush and then tripled the lead, converting a penalty kick that he earned just before halftime. Sophomore Tony Bozza added a fourth goal in the 50th minute off an assist from Koch. Mansfield, 4 @ Oliver Ames, 1 – Final – Mansfield opened the scoring in the fifth minute, using a throw in from Max Gurnon to find Brendan Sullivan, who set up James Chotkowski for the goal. Just three minutes later, Kevin Bouck doubled Mansfield’s lead off a cross from Chotkowski. Oliver Ames pulled a goal back with Matt Alvarado scoring off an assist from Thomas McCormick but Mansfield added two more goals in the second half; one from Sam Hyland off a throw from Gurnon and one from Gurnon on a long-distance free kick. Jed Tolbert totaled eight saves in net. “The whole team played great team defense for the entire game,” Mansfield head coach Steve Sheridan said. Taunton, 2 @ Attleboro, 1 – Final – Olivia Sweeney and Sam Tichelaar had goals for the Tigers, while Sweeney and Izzy DaCosta recorded assists. Canton, 7 @ Stoughton, 1 – Final – Freshman Chinazo Odunze scored for Stoughton. Franklin, 3 @ King Philip, 1 – Final – Miranda Smith, Halle Atkinson, and Molly Duncan (from the penalty spot) scored the goals for the Panthers. Lauren DeStefano had an assist in the win. Oliver Ames, 0 @ Mansfield, 0 – Final – Click here for a recap of the game. Sharon, 1 @ Milford, 1 – Final – Alex Rabb scored the goal for the Eagles, while Kristen Franzini scored for Milford, assisted by Juliana France. Mansfield, 3 @ Sharon, 0 – Final – Mansfield picked up the sweep on the road at Sharon on Friday afternoon. Emily Kleber, Chloe Peters and Julia Harrison each had five kills for the Hornets while Peters added 10 service points and Harrison finished with 16 service points. Jacey Anderson added nine service points and Jess Haradon had 12 digs for Mansfield. Oliver Ames, 3 vs. Ursuline, 1 – Final – Oliver Ames didn’t let a third set loss affect them, bouncing back for a big win in the fourth set to ice the match (25-22, 25-23, 22-25, 26-24). Katie Flynn led OA with eight kills and two assisted blocks. Bridget McCarthy added 33 assists and five aces, Alyssa Gavin had 18 digs, three assists and three aces, Emma Petrillo chipped in with 10 kills, four digs and two aces, Maya Fetcho added eight kills and Kayla Raymond finished with four blocks and 10 kills for OA. Stoughton, 3 vs. Fontbonne, 1 – Final – Senior Riley Bagley and junior Val Whalen combined for over 25 kills to lead the Black Knights offensively. Senior Christina Gelin led Stoughton with over 30 digs. Stoughton head coach Erica Batchelder said junior Haley Stone had strong serving and provided a solid force in the back row. Franklin, 2 @ Canton, 3 – Final – Canton twice erased a one goal deficit and then took its first lead, Emily Campbell scoring the game-winner on a penalty stroke with six minutes to play. Franklin went up 1-0 on an unassisted goal from Annie Walsh and then 2-1 when Walsh scored again on a pass from Caroline Lounsbury. Oliver Ames, 3 @ Milford, 1 – Final – Sydney Hedrick, Sarah Stevens and Kayla Lozzi each scored once for Oliver Ames while Kendall Clifford, Dimitra Efremidis and Cristina Boudreau each recorded an assist. Head coach Abby Tepper lauded the defensive effort of Katie Davenport and goalie Katie Vamosi. Mansfield, 172 @ Franklin, 169 – Final – Franklin’s Matt D’Errico shot a team-low round of 41 while Bryan Woelfel added a 42 and both Connor Norton and Matt Dao shot 43 to help the Panthers edge Mansfield. Brendan Loomer was the match medalist, shooting a low round of 38 for the Hornets while Jason Hindman carded a 41. Attleboro, 1 @ Franklin, 1 – Final – Ahijah Joseph gave Attleboro the lead with an 18th minute goal, an advantage the Bombardiers took into the halftime break. Franklin senior Hatim Brahimi found the equalizer in the 69th minute to level the scoring. Canton, 3 @ Foxboro, 2 – Final – Canton sophomore Paolo Ruggeri scored in the final minutes of the came to complete the Bulldogs’ comeback. Foxboro’s Anthony Barreira and Jeff Melo scored goals in the first half as the Warriors took a 2-0 lead into halftime. But Canton senior Ben Waterhouse cut into the lead with a goal in the 52nd minute and sophomore Paul Corcoran tied the game in the 55th minute. Ruggeri was able to convert with under two minutes to play for the game winner. King Philip, 2 @ Mansfield, 0 – Final – Sophomore Tony Bozza netted his first career goal in the opening minutes of the contest off an assist from Thomas Lugten and Lugten doubled the lead before the halfway mark of the first half to lead King Philip. Bozza used a one time finish off a pass from Lugten to put KP up 1-0 in the 2nd minute. Lugten then took a flick from Colby Koch and tucked his chance into the net from inside the area. KP head coach Nick Gale said his back four of Jack Bush, Cam Mullins, Ryan Coulter and Larsen Keys had a strong defensive game in front of goalie Eli O’Neill, who had a strong game against Mansfield’s set pieces. North Attleboro, 0 @ Milford, 2 – Final – Pedro Sampaio netted a pair of second half goals to lead the Scarlet Hawks to their second straight win. Sampaio converted a penalty kick to put Milford up 1-0 and then carried possession across the edge of the area before firing in his second of the game. Taunton, 0 @ Oliver Ames, 2 – Final – Joe Cerqueira and Nathaniel Cardoza each scored in the first half for Oliver Ames. James Gillespie assisted on Cerqueira’s goal and Chris Lawrence set up Cardoza’s goal. Stoughton, 2 @ Sharon, 4 – Final – Sharon cashed in on a pair of corner kicks to build a 2-0 lead at halftime and converted on a free kick for a 3-0 advantage early in the second half. Andrew Reyes Jones opened the scoring, converting a corner from Michael Baur. Jeffrey Gao doubled the lead, finishing off another corner from Baur. Ben Stamm headed home a free kick from Ian Camilli to make it 3-0. Stoughton responded with a pair of goals with sophomore Fabio Ponce De Leon finishing a lofted pass from Tyler Melo coming first and Jordan Asnes finishing a cross from Goddy Fombe to make it 3-2. Camilli iced the game with his second point of the game with a strike from just outside the area to cap the scoring. Franklin, 3 @ Attleboro, 0 – Final – Miranda Smith scored twice and assisted on the third goal for the Panthers. Jess Kroushl added a goal and an assist and Emily Mastaj had an assist for Franklin. Mansfield, 5 @ King Philip, 1 – Final – Emma Oldow scored once and had two assists, Allee Bezeau netted a pair of goals and Emma Goulet and Steph Kemp each scored once and had an assist in Mansfield’s win. Avery Snead scored for King Philip. Milford, 1 @ North Attleboro, 1 – Final – Milford converted a corner kick to pick up a tie on the road at North Attleboro. Nicole Dahlgren scored off of Maddie Boyle’s corner for the Scarlet Hawks. Milford head coach Jay Mastaj praised the two-way play of Ashleigh Starks and Maggie Boyle. Oliver Ames, 3 @ Taunton, 1 – Final – Anna Tempestoso, Kiana Lozzi and Abby Reardon were the goal scorers for OA and Zoe Chazon added two assists for the Tigers. Samantha Tichelaar scored for Taunton. Sharon, 11 @ Stoughton, 1 – Final – Sharon’s Alex Rabb registered her third hat trick of the season to lead the Eagles while Ally Filipkowski, Jessie Tarnoff and Amanda Klayman each scored two goals apiece. Ally Steinberg and Maxine Gordon each scored once for Sharon. Mansfield, 3 @ Oliver Ames, 1 – Final – Mansfield picked up a 25-16, 20-25, 28-26, 25-19 win on the road at Oliver Ames. Olivia Broyles had nine blocks and four kills for the Hornets while Chloe Peters added 20 service points and Jess Haradon and Jacey Anderson combined for 20 digs. Oliver Ames’ Bridget McCarthy had 27 assists and five aces and Maya Fetcho added 11 kills. Milford, 3 @ Sharon, 2 – Final – Sharon junior Jess Allan led the Eagles’ offense with nine kills and Cori Jermyn added seven kills. Stoughton, 0 @ Canton, 3 – Final – Maggie Malloy accounted for all of the scoring in the game, scoring a hat trick to lead the Bulldogs. North Attleboro, 0 @ Foxboro, 1 – Final – Jaclyn Brion scored the lone goal of the game with eight minutes remaining to earn Foxboro’s fifth straight victory. Mansfield, 4 @ Oliver Ames, 6 – Final – Click here for a recap from the game. Click here for a photo gallery. King Philip, 1 @ Franklin, 1 – Final – Click here for a recap from the game. Sharon, 181 @ Stoughton, 192 – Final – Max Avratin was the match medalist, shooting a low-round of 44 to lead Sharon. Cam Doherty and Zach Gay led Stoughton, both shooting a round of 47. Taunton, 191 @ Milford, 154 – Final – Three Milford golfers broke 40 on the day to pace the Scarlet Hawks to the win. Ryan Tomaso carded a low round of 35 while Anthony Arcudi shot 38 and Tylor Renaud carded a round of 39. Canton, 153 @ North Attleboro, 149 – Final – Four different golfers shot under 40 for the Rocketeers to edge Canton in a key Davenport division showdown. Robbie Congdon shot a 36, David Colasanti shot a 37 and Dylan Kane and Tyler Sinacola both shot 38 in the win. Canton’s Matt Minichiello was the match medalist, carding a low round of 35. 1st Quarter: (NA) Chad Peterson 17 yard pass to Hacmoni Cuevas, Geoff Wilson XP good. 2nd Quarter: (NA) C. Peterson 18 yard pass to H. Cuevas, XP missed; (NA) Nick Rajotte 5 yard rush, C. Peterson 2pt pass to Bobby Mylod; (S) Evan Gibb 35 yard pass to Izon Swain-Price, XP missed. 3rd Quarter: (S) E. Gibb 13 yard rush, 2pt failed. 4th Quarter: (NA) Zach DeMattio 4 yard rush, XP missed; (S) E. Gibb 7 yard pass to Swain-Price, Josh Cocchi XP good; (NA) Kyle McCarthy 22 yard rush, Devin Slaney XP good. 1st Quarter: (M) Joe Cox 1-yard rush, Diogo DeSousa XP good; (M) Anthony DeGirolamo 1-yard rush, D. DeSousa XP good; (M) Nick Graham 44-yard rush, D. DeSousa XP good. 2nd Quarter: (M) A. DeGirolamo 4-yard pass to Hunter Ferreira, D. DeSousa XP good; (M) N. Graham 7-yard rush, D. DeSousa XP good. 3rd Quarter: (A) Tyler McGovern 13-yard pass to Elvin Sam, Paul Deluca XP good. 4th Quarter: (M) D. DeSousa 33-yard FG. 1st Quarter: (F) Jake Noviello 33 yard pass to Connor Peterson, XP missed. 2nd Quarter: (F) Jake Wolowacki 23 yard rush, Matt Zucco XP good; (F) J. Noviello 13 yard pass to C. Peterson, M. Zucco XP good. 3rd Quarter: (F) J. Noviello 17 yard pass to J. Wolowacki, M. Zucco XP good. 4th Quarter: (T) Noah Leonard 24 yard pass to Adam McLaughlin, Nuno Camara 2pt rush. 1st Quarter: (KP) Brendan Lydon 3 yard rush, Matt Franz XP good. 2nd Quarter: (KP) Sean Garrity 35 yard rush, XP no good. 3rd Quarter: (KP) Alex Olsen 65 yard rush, 2pt run good; (OA) Kyle Gagliardi 1 yard rush, 2pt failed; (KP) S. Garrity 75 yard rush, M. Franz XP good; (KP) A. Olsen 2 yard rush, M. Franz XP good. 4th Quarter: (KP) Liam Cullagh fumble recovery in end zone, XP good. Foxboro, 1 @ Stoughton, 3 – Final – Loubensky Lucas scored a hat trick for the second time this week, giving the Black Knights their third win of the week. Marco Antunes set up Lucas’ first goal, sending in a cross for Lucas to finish with a volley. Brian Peoples sent Lucas in on a through ball for the second goal and Lucas completed his hat trick by cleaning up a rebound. Stoughton head coach Aaron Salter noted the strong play of Tyler Melo and Luis Nascimento. Foxboro sophomore Shane VandenBoom score the lone goal for the Warriors. Sharon, 1 @ North Attleboro, 1 – Final – Sharon took a 1-0 lead into the halftime break after going ahead in the 20th minute but the Rocketeers found the equalizer in the second half. Leo Charlebois tied the game in the 63rd minute after Jeff Gale – in his varsity debut – set it up with a hustle play to force a turnover. Oliver Ames, 1 @ King Philip, 2 – Final – Colby Koch scored off an assist by Jack Bush and Larsen Keys scored from a Tyler Mann assist to give KP a 2-0 lead at halftime. James Gillespie pulled one back late for OA on an assist by Matt Campbell, but the Warriors hold on to stay unbeaten. North Attleboro, 4 @ Sharon, 0 – Final – North Attleboro junior Haley Guertin netted a hat trick to pace the Rocketeers’ offense on Friday. Ashlyn Gaulin also scored for Big Red while Aine Mendonca and Emma Gaulin each notched an assist. King Philip, 0 @ Oliver Ames, 3 – Final – The Tigers got goals from Lauren Wright, Gabi McLaughlin, and Abby Reardon in the win. Oliver Ames, 3 @ Attleboro, 1 – Final – Oliver Ames’ Bridget McCarthy recorded her 1,000th assist in the win, becoming the first Tiger to do so in program history. Sharon, 0 @ Canton, 3 – Final – Canton notched a 25-18, 25-15, 25-18 sweep in what head coach Pat Cawley called a total team effort. Cassie Loftus led Canton with six kills and three blocks and Casey Shea added five kills and four blocks. Malia Claiborne had four aces and Maria Mackie added three aces and played well at the net. Sharon junior Jess Allan led the Eagles offense with 13 kills, senior Natalie Kane added six kills and two block kills and senior Faythe Gomolka had 13 assists from her setting position. Stoughton, 0 @ North Attleboro, 3 – Final – Stoughton sophomore Molly Turner tallied 10 assists and head coach Erica Batchelder said Turner was a dominant presence at the net. Taunton, 0 @ King Philip, 3 – Final – King Philip pulled out a close win in the first set and went on to pick up a sweep, 25-23, 25-17, 25-11. Carly Adams had 19 service points to lead KP and added 16 assists, Sydney Phillips paced the offense with 11 kills, Amanda Loewen added nine digs and Elise Pereira chipped in with four digs. Sharon, 1 vs. Norwell, 0 – Final – Sarah Schultz scored the lone goal of the game to lead the Eagles to their first win of the season. Stoughton, 2 @ Brockton, 2 – Final – Mia Russell and Kelly Joyce scored for Stoughton. Oliver Ames, 143 @ King Philip, 160 – Final – Brady Allbritton was the match medalist, shooting a round of 34 to lead Oliver Ames. Sebastian Ladoulis led King Philip with a 37. Canton, 172 @ Sharon, 178 – Final – Bubba McNeice earned his first match medalist honor of the season, carding a round of 42 to lead the Bulldogs. Matt Minichiello and Jack Goyetch each shot 43 and Joey Vaughan added a 44. Max Brody and Russ Rapaport each shot 44 for the Eagles.